I got home from my ride today about a half an hour later than I expected. I guess I'm not as fast, or as strong, as I use to be. I haven't ridden the length of Bull Road for a while. Today seemed like the perfect day to check it out. It's a fun ride...and a beautiful ride...but getting to the far end of Bull Road is a round-about route. Pedaling out of the development today I headed to towards Route 74 and Dover, PA. 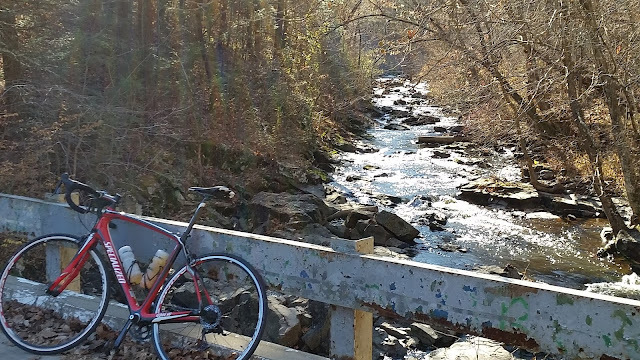 It was a great day to be on the bike. The sun shining, just a slight breeze, and the 50 degree temperatures felt amazing. On a Sunday afternoon, the traffic on 74 wasn't too bad. 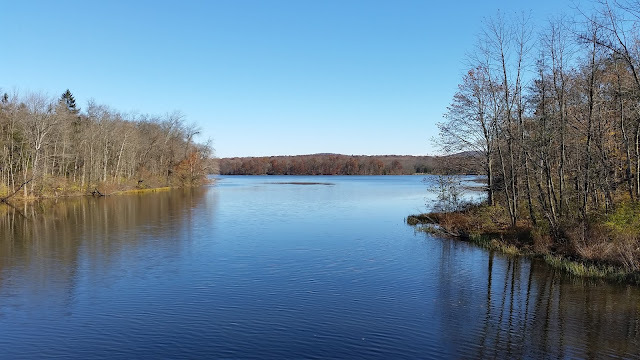 Six miles northwest of Dover, I made a right turn onto Rosstown Road and passed through Gifford Pinchot State Park. Named after Governor Gifford Pinchot, the park is a destination for hikers, campers, and fishermen. Gifford Pinchot served as Pennsylvania's governor from 1923 to 1927 and again from 1931 to 1935. He was a tireless worker for the people of Pennsylvania. 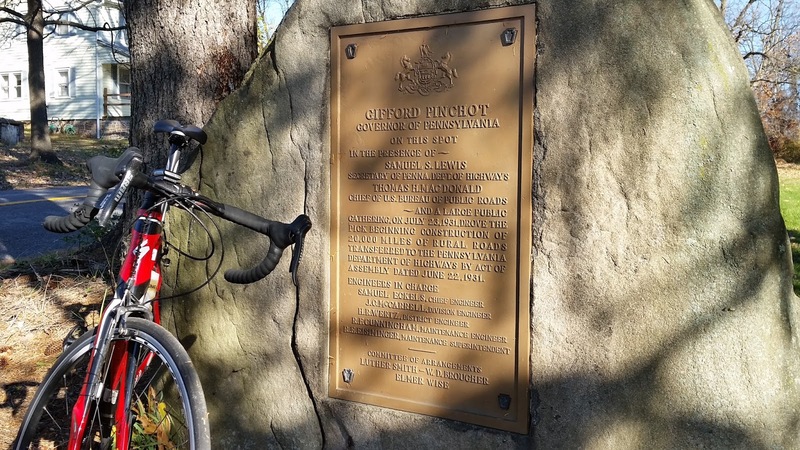 During the Great Depression, Governor Pinchot set up work camps that built over 20,000 paved roads throughout Pennsylvania for "taking the farmer out of the mud." His programs made it easier for Pennsylvania farmers to get from farm to market and they became the model for President Franklin Roosevelt's Civilian Conservation Corps. Today, the lake that bares his name, looked beautiful from Rosstown Road. 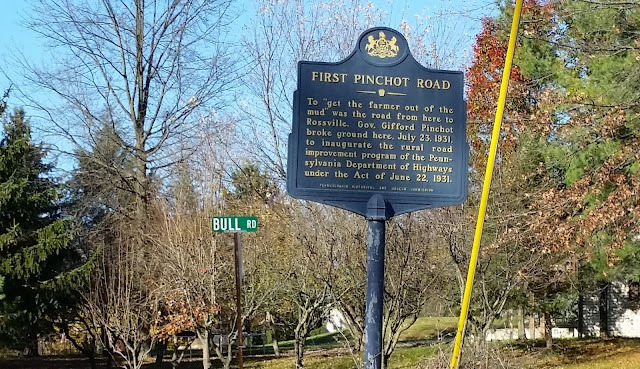 At the beginning of Bull Road travelers are greeted with a stone tablet marking the spot where Governor Pinchot turned the first spade of dirt that began the paving of Pennsylvania's rural roads. From North to South, Bull Road is nine miles of cycling bliss starting with a fast ride down towards a one lane bridge that passes over a beautiful creek littered with rocks and boulders. I don't get here often...but it is one of my favorite places to ride. Around the next turn, I crossed over the Conewago Creek...then the uphill climbs begin. Gradual at first, the incline begins to get steeper and steeper, eventually climbing over 500 feet in less than four miles! It makes the downhill ride to Canal Road feel so good. Canal Road between Bull Road and Manchester is heavily traveled and has no shoulder. It's no one's first choice to cycle on. Today I took it to get back home as quickly as I could. As mentioned above...I'm not as fast as I once was...and I was late for a lazy afternoon with my wife. I wouldn't miss that for anything...that's no bull. 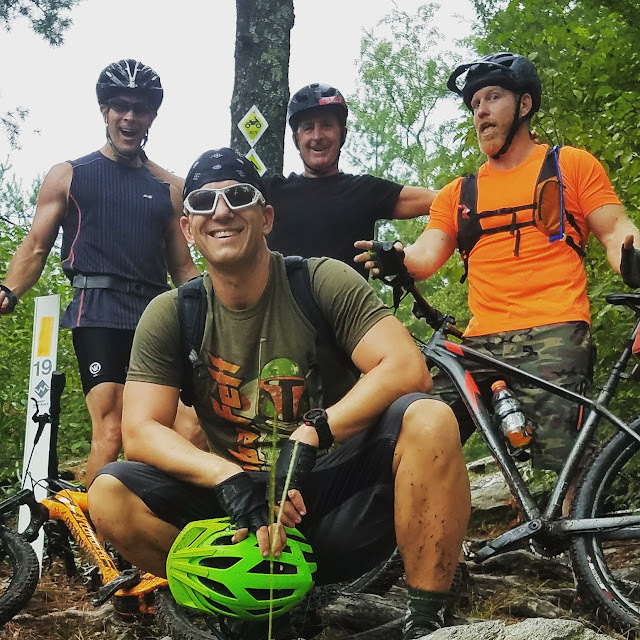 Be sure to check out the new website for ALL TRAILS LEAD TO ICE CREAM to see all of our ride pics, trail maps, and so much more.